There are few places in the world where you can stop the car get out and take a great roadside shot, then hike into the backcountry to capture an unrepeatable moment in nature. Patagonia is one such place. When professional landscape photographers need to juice their creative mojo they often visit Torres Del Paine in Chile and Los Glaciares National Park in Argentina. There are a few other places in the world that have superb mountain/lake/river/glacier scenery, but for photography no other place combines those elements with Patagonia’s rapid changes of weather and light. If you have never photographed a lenticular smoke cloud or an ethereal wave cloud against a granite wall of spiked peaks then put Patagonia on your photo bucket list now. On Tusker’s two annual trips to Patagonia: Torres Del Paine with an option to Argentina’s Mount Fitzroy and Glaciares National Park (March, November) the adventure traveling photographer gets to walk in the boots of Galen Rowell and those who have followed. 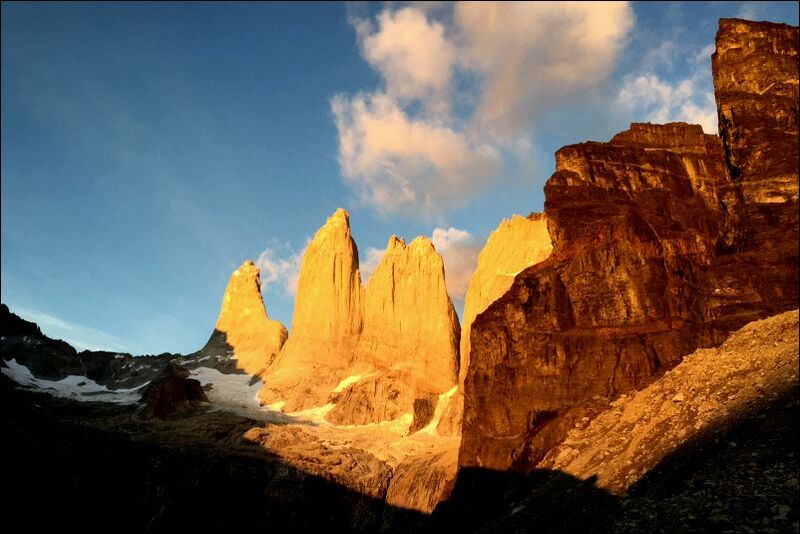 It was Rowell in the 1980s that captured the powerful majesty of Torres Del Paines’ horned towers putting the park on the world’s must see map. His approach was art becomes part of the adventure and vice versa. On Tusker’s treks into the Patagonian backcountry you will have chances to capture images that will stimulate your artistry and stoke your adventure travel fire for the rest of your life. It won’t be easy and will take a physically artistic approach. Not everyone on a Tusker trek will share your passion for photography. Tusker does not do specialized photography focused trips in Patagonia so when the group is sleeping at dawn or eating at sunset you will be positioned for the sun hitting the mountains or the sunset backlighting the clouds over the peaks. Your guides are sensitive to your photo desires, but it’s also up to you to go the extra mile to get that great shot even if it means getting up on a cold morning to capture the image. Your best light anywhere is dawn and dusk and Patagonia is no exception, but even in the harsh light of midday your camera is handy and your eye is sensitive to the clouds and shifting weather. If the wind stops and there is a reflection of the mountains in a lake you are keen to capture that moment. When a guanaco glides across a meadow in the foreground with a lake and mountain scape in the background, you don’t want to miss that either. Always be alert for the next great image. Talk less while on the trail and you will observe more. The biggest challenge to backcountry photography in Patagonia is how to pare down your gear. On the five day W circuit, a 60 mile trek through one of the most photogenic landscapes in the world, you will have to tote your own pack. The park does not allow porters on these fragile trails so you will shoulder a 30 pound pack over steep terrain that must contain all the things you need for those five days. Many who try the W Circuit with heavy camera gear have wished they hadn’t as the rocky trails in the French Valley make their lives miserable. Scrambling over and descending large boulders with heavy camera gear is not the way to go. Your camera and affiliate photo gear should weigh less than ten pounds on the five day circuit trek. You can have heavier lenses, tripod et al on the trip but not on the W circuit portion. Heavy camera gear is for roadside photography not when you to hike into true backcountry. Rowell never lugged heavy camera gear as his dangerous technical climbs led to incredible shots all with his lightweight camera. He became an expert using ultra-lite cameras to get heavyweight images. “It’s not about the camera, the priority is to be there when the light is right, even if with a simple camera and lenses,” was Rowell’s backcountry photo credo, but also says a lot about his self-deprecation. He had a world class eye for the interplay of nature’s complexity and competing forces. He was also on assignment for National Geographic and had a lot more time in the field to wait for that great shot to reveal itself than you will on your 14 day Patagonia Tusker trip. But that doesn’t mean we can’t come back from Patagonia with great images. In this digital age where cameras have gotten lighter and more compact, the backcountry photographer has huge advantages over previous generations. What you can’t carry can be made up with your imagination and desire to get great images of the peaks in their majestic moods. Perhaps the most challenging icon to capture in Patagonia is its glaciers. These behemoths are both ethereal ghosts and radiant blue portholes into the world’s environmental health. Any great photo will mesmerize the viewer’s eye, but on a secondary level seep into the subliminal. The melting glacier shot could cause the viewer a moment of environmental melancholia. But before your glacier photo can do any of this, you must be up to the technical challenge. Use a polarizing filter that reduces haze and darkens the glacier’s colors. A glacier’s brightness plays havoc with automatic cameras that overcompensate with their brightness washing out the image. By switching your camera to its manual mode you can prevent the camera from under exposing the image. An ambient light meter is useful in giving you a more accurate setting. Glaciers always photograph better in Patagonia’s colder months when there is less or no melting. Keeping your gear dry is essential so waterproof camera bags are as important as extra lenses caps and filters. Bring everything with you as there is little to no quality photo items to be bought once in Patagonia. Use high quality filters that are like armor against the wind yet don’t degrade your image. The pros pack neutral density filter kits that enable them to blur the flow of sunlight off waterfalls and soften the reflections of light on rippled water. Don’t buy a new camera for Patagonia unless you have spent several months with it shooting in your local mountains and watery landscapes. Know what your camera can do realizing its limitations as well as its possibilities before you board the plane. And this may be a no brainer, but never check your camera gear while flying, carry it on the plane. Patagonia’s best photos are not just shot in color. A wind-chiseled gaucho riding his wild-eyed steed always looks like a heroically lonely vestige from our black and white past, especially when shot in black and white. The luminous granite peaks and the blinding glaciers can also be beautifully replicated in black and white. It’s almost easy to do justice to a Patagonian field of pink lupines in the foreground, with a turquoise lake and the towers of Paine under wispy clouds in the background. Great obvious images abound in Patagonia, but develop an eye for what others don’t see. Find a fallen dead tree on a slope with the looming towers behind. It can produce one of those multi-layered psychic images that made photographers like Ansel Adams and Galen Rowell artists. When you come home from Patagonia edit your work carefully and honestly. Pick your three best shots, frame them and put them up in your man/woman cave. These photos will be constant memories of your trip triggering that day in the mist when it suddenly cleared enabling you to capture an unrepeatable moment in nature. You earned that moment by trekking to the southern end of the earth across one of the world’s great backcountry landscapes and you did it with a high sense of artistry and adventure.